Ducati UK are celebrating the 8th successive year of the Ducati Performance TriOptions Cup with an incredible new offer of accessories when purchasing a new 959 Panigale. The Ducati Cup has become the longest running one make series supporting British Superbike and arguably the most successful with over 50 riders registered for this year’s championship. 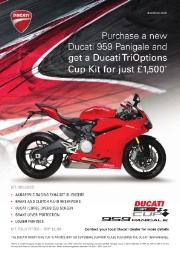 To celebrate this success and highlight the Ducati Performance accessories available for the 959 Panigale, Ducati UK are offering a Ducati Performance TriOptions Cup package worth £3789 for just £1500 when purchasing and registering a brand new 959 Panigale. This offer is available between 1st April and the 30th June 2017 and includes free fitting. * Terms & conditions apply, images for illustration purposes only. Offer valid when purchasing a new Ducati 959 Panigale. Value of items indicated is RRP inc. VAT. £1,500 is for the kit only and does not include the cost of the bike. Bikes must be registered between 1st April and 30th June 2017. Powered by vBulletin 3.5.4 - Copyright © 2000 - 2019, Jelsoft Enterprises Ltd. - © Ducati Sporting Club - All times are GMT +1. The time now is 01:33 PM.